The district (Chamberi) is one of the most popular in Madrid . Charming, modern and quiet 3 bedroom apartment, and located in a quiet boulevard but no more than 5 minutes far from the best bars, restaurants, jazz clubs, cinemas and theaters (Canal Theatre is the biggest cultural complex in town with a wide range of different performances open 365 days a year). The apartment is at 10 minutes by Metro from all Madrid's best known tourist interest spots. You will find four different Metro lines (1,2,4,7) departing from four different stations (Canal, Iglesia, Bilbao and Quevedo) at no more than a five minutes walk . However, you can always reach all you wish to visit in Madrid downtown just by foot if you like promenades in town. You have a children playground in the nearest square. The public open air swimming pool of Canal opens from the end of may until the 15Th of September on the opposite direction. Check-in: from 4:30 p.m. to 10:30 p.m.
Additional information about the location and surroundings will be provided at arrival. The landlord Andres was friendly and accommodating. Lovely well kept property in a great area of the city. Owner was very helpful. We had a great time and wouldn’t hesitate to recommend to anybody. Thank you! Great location! Easy subway ride to all sights. Spacious accommodations. Only downside is that the double bed in the master bedroom is very short. I'm 5'9'' and my feet were off the bed. Husband is 6' and had it even worse. One bar of soap was provided for 2 bathrooms and five people (and no hand soap) so we bought some. Other odd thing is that the owner really wanted us to take out the garbage. While happy to do so, no garbage bags were provided for the kitchen or bathrooms. We used a plastic bag we got from groceries but couldn't take out the bathroom trash. I would definitely rent this apartment again. It's close to the metro, there's a supermarket within easy walking distance, and some great neighborhoods are a pleasant stroll away. We had high expectations of our accommodations in Madrid. This apartment far exceeded them. We look forward to returning. Lots of groceries stores including a 24 hour one nearby. Plaza de Olavide was an unexpected pleasure one block away. Special thank you to Andres for being a great host. We loved the area, Plaza de Olavide was fabulous for enjoying the Madrid way of life during a very hot week and the location between two metro lines made getting around really easy. The apartment was great, a real sanctuary after our busy days. 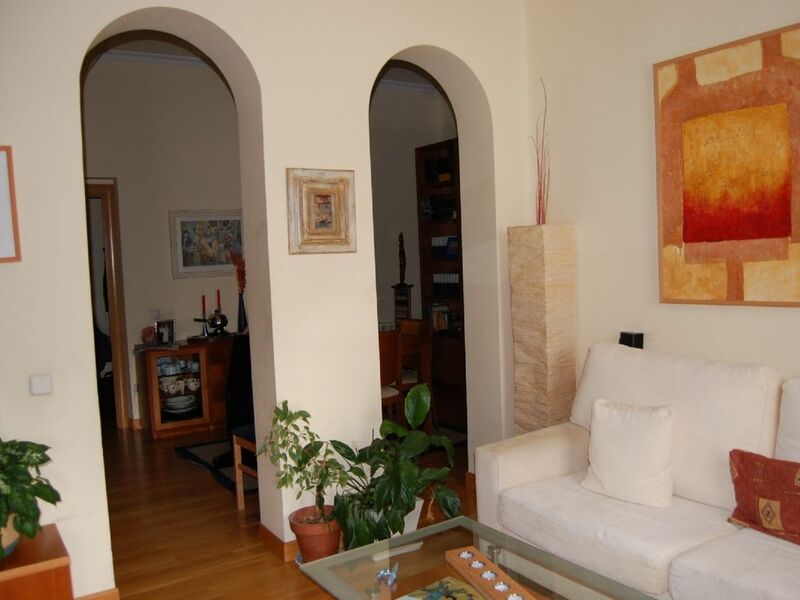 Located in a very popular district amongst people living in Madrid between the Financial City and the Old town. You have several restaurants, cinemas, theaters and services just round the corner, even if the street is a quiet and large boulevard. Four different metro stations, Canal, Iglesia, Quevedo and Bilbao ( lines 1, 2, 4 & 7) connecting all the main interest points in town, are close to the apartment (no more than 5 min. walk). You can also reach by walk the old town, flee market, Royal palace and Prado & Thyssen Museums. Rates are set in a weekly basis of 7 nights. A minimum stay of three nights is required during the middle and low seasons, and six nights during high season periods. Please note that any fee related to the payment of the deposit shall be added to the total price (mailed bank drafts and using credit card with Paypal includes fees that are charged to the receiver of the payment).